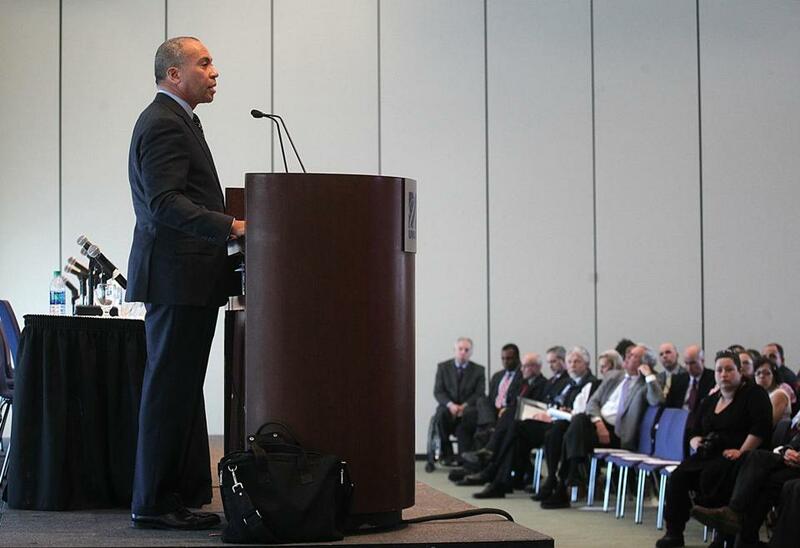 Massachusetts Governor Deval Patrick made his remarks during a speech outlining proposed changes to the criminal justice system. Governor Deval Patrick said Thursday that he asked the Department of Correction for a complete accounting of official actions taken in the aftermath of a 2009 homicide at Bridgewater State Hospital, and pledged to curtail the use of the type of restraints linked to the mental health patient’s death. Patrick, who made his remarks during a speech outlining proposed changes to the criminal justice system, vowed to release the results of the review within days. “Unless it can be said with certainty that the inmate poses a serious and immediate physical danger to himself or his fellow inmates, he should not be tied down, limb-by-limb, in the 21st century here in Massachusetts,” Patrick said, drawing applause during his speech to hundreds of correction officials at the UMass Boston campus. Patrick said the case of Joshua K. Messier, a 23-year-old mental health patient who was killed as seven guards bound his wrists and ankles to a small bed, illustrates the need to use solitary confinement and what are known as four-point restraints with great care, particularly in cases of mentally ill inmates and patients. “As we saw recently in the awful death of Joshua Messier, using methods of restraint in response to mental health issues may seem reasonable in the moment but does not necessarily protect the inmate or the officers,” Patrick said. Patrick’s comments came as he announced a multi-faceted program with the goal of reducing recidivism by prison inmates by 50 percent. The Globe reported Sunday that Messier, a paranoid schizophrenic sent to Bridgewater for psychiatric evaluation, was calm and cooperative in the minutes before he was placed in four-point restraints. Messier, a former UMass student who spent the last years of his life cycling through mental health facilities, was admitted to Bridgewater in April 2009 after staff members from the psychiatric unit at Harrington Memorial Hospital filed misdemeanor assault and battery charges against him. A month later he was dead. On the night he died, Messier allegedly struck a guard during a brief psychotic episode. Guards answering an emergency call then took Messier to Bridgewater’s Intensive Treatment Unit to place him in four-point restraints. In a scene captured on surveillance video, two of the guards first pressed down hard on Messier’s back while his hands were cuffed behind him, forcing Messier’s chest toward the tops of his legs. The maneuver, sometimes called “suitcasing,” is forbidden in Massachusetts prisons because of the risk of suffocation. In the video, the guards unfolded Messier’s motionless body and went about placing him in the four-point restraints, apparently failing to notice when he stopped breathing and lost consciousness. The examiner’s autopsy also found injuries consistent with a beating, including bleeding on Messier’s brain and “blunt force” injuries to his neck, torso, arms, and legs. An autopsy photograph shows a deep gouge on the top of his head. But five years after Messier’s death no one has been prosecuted or even punished and all but one of the guards still works for the correction department. 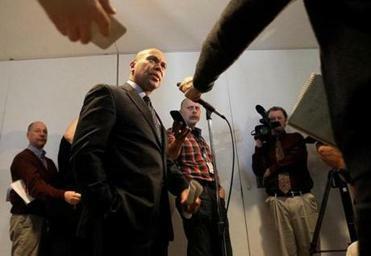 On Thursday, during remarks to reporters following his speech, Patrick said he was particularly concerned with a 3½-year delay between Messier’s May 2009 death and the completion of an internal review of the matter, which was signed in January 2013 and apparently referred to Department of Correction Commissioner Luis S. Spencer. The internal review by the Department of Correction’s Special Operations Division “rejected” the explanation for the use of force provided by Bridgewater State Hospital staff members and cited the guards for violating two directives. Despite its name, Bridgewater is a medium security prison that provides mental health services to inmates and patients. It is not a hospital. The office of Plymouth District Attorney Timothy J. Cruz has said it decided to drop a criminal investigation into Messier’s death without presenting evidence to a grand jury because the medical examiner, Mindy J. Hull, was unable to pinpoint a specific cause of death. Earlier this week, Patrick said he would not comment on whether he believes Cruz made the right decision. But the Globe reported that investigators from two additional agencies also faulted the correction officers. Walker also said that when Department of Correction officials allow guards who use excessive force to continue holding their jobs they create a climate of fear in state prisons and, in Messier’s case, in a facility that is charged with caring for the mentally ill.
After Cruz decided to drop his criminal investigation, Messier’s parents — Lisa Brown and Kevin Messier — filed a civil lawsuit against nine guards, two nurses, Bridgewater State Hospital and the Department of Correction. On Thursday, Brown said she was gratified to learn her son’s death might lead to reforms in the prison system but also said guards and other officials responsible for her son’s death should be prosecuted. In his speech, Patrick also said his administration will eliminate the use of restraints — “finally, completely, and immediately” — on pregnant inmates in labor even though regulations already prohibit the practice. The Department of Correction, Patrick said, will issue new, emergency regulations extending the ban to county houses of correction, while his administration supports passage of a legislative ban. “Regulation is good, but here law would be better,” he said. Patrick’s comments on the use of restraints and the Messier case were made as he unveiled a series of proposals aimed at reducing recidivism — the rate at which released inmates return to prison — by 50 percent over the next five years. The proposals include providing addicted detainees with injectable Vivitrol, a medication that helps heroin users and alcoholics quell their addictions, and a “stepdown” program under which state prison inmates would be transitioned to society through county correctional facilities before their release. Patrick also said his budget proposal for the fiscal year that begins in July calls for doubling the number of mental health speciality courts from three to six to prevent people who commit crimes because of mental illness from being sent to state prison or county houses of corrections. “Rather than punish the symptom, we need to treat the illness,” Patrick said. Patrick’s speech and a related conference were presented by MassInc., a nonpartisan public policy group.